Economic and Philosophic Manuscripts of 1844 (also referred to as The Paris Manuscripts) are a series of notes written between April and August 1844 by Karl Marx. Not published by Marx during his lifetime, they were first released in 1932 by researchers in the Soviet Union. The notebooks are an early expression of Marx's analysis of economics, chiefly Adam Smith, and critique of the philosophy of G. W. F. Hegel. Die Bewegung der Produktion by Friedrich Wilhelm Schulz is also a key influence. The notebooks cover a wide range of topics including private property, communism, and money. They are best known for their early expression of Marx's argument that the conditions of modern industrial societies result in the estrangement (or alienation) of wage-workers from their own work, their own products, and in turn from themselves and from each other. 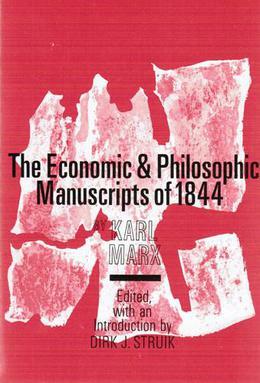 Because the 1844 manuscripts show Marx's thought at the time of its early genesis, their publication, in English not until 1959, has profoundly affected recent scholarship on Marx and Marxism, particularly regarding the relation of Marxism to earlier work in German Idealism. The young Marx had been relatively ignored until recently, because his early works were considered more "philosophical" and by some as not "scientific" enough, that is, "economic" as in Das Kapital. However, Marxist humanists regard this book as one of the most important texts by Marx and crucial for understanding his entire thought, and Marxians also refer to it. In the first manuscript in which there are extensive quotes on economics from Adam Smith, Marx exposes his theory of alienation, which he adapted (not without changes) from Feuerbach's The Essence of Christianity (1841). He explains how, under capitalism, more and more people rely on "labour" to live. That is, before people could rely in part on Nature itself for its "natural needs"; in modern society, if one wants to eat, one must work: it is only through money that one may survive. Thus, if the alienation of the worker consists in being a "slave toward its object", the worker is doubly alienated: "first, he receives an object of labour, that is he finds work [as one says: 'I finally found work! '], and second, he receives means of subsistence. He thereby owes it [to labour] the possibility to exist first as a worker, second as a physical subject. The last straw of this servitude [or serfdom] is that it is only his quality as a worker that permits him to continue to conserve himself as a physical subject, and it is only as a physical subject that he can be a worker". In other words, the worker relies on labour to gain money to be able to live; but he doesn't live, he only survives, as a worker. Labour is only used to create more wealth, instead of achieving the fulfillment of human nature. Within classical political economy, economists lay out theories determining value in terms of precious metals or money such as silver and gold, costs of production, amount of labour embedded within a product and the, in Marx's view, chaotic process of demand and supply. Money was invented only to overcome difficulties exchanging goods, since it was and still would be difficult to trade five oranges for half a dog. Hence money, as the empiricist John Stuart Mill says, is just the medium of exchange to be more flexible. For Marx, the problem with money consists of the fact that from being a substitute money becomes a good. It does not represent the value of a certain or several goods; instead, the value of those goods is represented by a certain amount of money. Therefore, due to its flexibility, money could purchase everything, as long as sufficiently available. The market mechanism for exchange altered and Marx claimed the market principle formula Money-Commodity-Profit (M-C-M') in contrast to the traditional formula Commodity-Money-Commodity (C-M-C) to be a perversion of the logic of market. As did Aristotle, Marx argues that the market system does not serve a mere desire of exchange, but the aim of profit. To gain profits, money is to be invested and thereby becomes capital resulting in capitalism. Marx defines capital as “accumulated labour”. The fetishism of money is born. Men are evaluated in terms of their materialistic creditability. This also becomes an economic judgement of their morality. The consequence is that human individuality and morality becomes a vehicle for money. Basic human ideals completely change. The main objective of men moves towards earning as much money as possible, putting everything else in background. This enhances the formation and size of gaps between the capitalist and the labourer, and gives power to those who are wealthy. This also means that the poorer become more dependent on the rich, since they are the rich’s employees. This is a rather unfortunate process for the poor, since they have to sell their labour to the capitalist and in return are being paid a wage. However, the capitalist pays lesser wage than the value added by the labourer. When he then brings the product onto the market, the labourer has to buy the product at a proportionally higher price than he can afford. Thereby it becomes impossible for the poor to build up capital and on the other hand quite easy for the capitalist to increase his. A situation of dissimulation and subservience of the poor is created. Developing this idea further on, the credit relationship becomes an object of trades of abuse and misuse. Reaching the state level fairly quickly it puts the state in power of financiers. For Marx, alienation exists mainly because of the tyranny of money. He refers to Aristotle’s praxis and production, by saying that the exchange of human activity involved in the exchange of human product, is the generic activity of man. Man’s conscious and authentic existence, he states, is social activity and social satisfaction. Moreover, he sees human nature in true common life, and if that is not existent as such, men create their common human nature by creating their common life. Furthermore, he argues similarly to Aristotle that authentic common life does not originate from thought but from the material base, needs and egoism. However, in Marx’s view, life has to be humanly organized to allow a real form of common life, since under alienation human interaction is subordinated to a relationship between things. Hence consciousness alone is by far not enough. To satisfy needs, property has to be exchanged, making it an equivalent in terms of trade and capital. This is called the labour theory of value. Property becomes very impersonal. It is an exchange value, raising it to become real value. The cause of alienation is to be found in capitalism based on private property of means of production and money. Capitalist organized labour exploits the working class. It is thrown back at animal level while at the same time the capital class gains wealth. Since nothing coming from nature can enter the market unaltered, exchange presupposes labour, especially wage labour. Marx is of the opinion that alienation reaches its peak once labour becomes wage labour. A capitalist hires a worker in order to be able to convert capital goods into final products. This does not imply that the product reflects the labourer’s needs in any way, but he produces it by processes alien to him. Furthermore, the wages only just cover the subsistence costs of the worker and his family. Hence the market price does not in any way reflect the wage, allowing the conclusion that the value added by the worker does not go back to the worker, but instead returns to the capitalist. A person who buys with money does not directly exchange the product of their labor. The primitive barter on the other hand, only exchanges a surplus of his own products, without exchanging money, but only to satisfy his needs. The more needs vary, the more workers have to specialize the more alienated they become towards each other. Alien needs drive the labourer to work for his only goal, which is the satisfaction of his subsistence needs, to guarantee mere existence. With his desire to guarantee his existence, the labourer becomes even more dependent on his employer and the product. The more human labour specialises the less human it gets. It rather develops towards commerce and seems to make man an automaton. This indicates and basically states that production causes men to behave like machines, implying that labour is completely alienated from the labouring subject as well as it is alienated from its object. Due to that, Marx regards the unity of human labour as its division, since the productive capability of cooperative labour is a function of specialization and division. He also denounces the impossibility of the labourers’ self-realization. This division of labour increases with civilization, meaning that with the introduction of money the worker no longer exchanges only his surplus, but his whole product for money. ^ German: Ökonomisch-philosophische Manuskripte aus dem Jahre 1844 or Pariser Manuskripte. ^ Levine, Norman (2006). Divergent Paths: The Hegelian foundations of Marx's method. Lexington Books. p. 223. ^ Sperber, Jonathan (2013). Karl Marx: A Nineteenth-Century Life. W. W. Norton & Company. p. 144. ^ Tedman, Gary. (2004) "Marx's 1844 manuscripts as a work of art: A hypertextual reinterpretation." Rethinking Marxism 16.4: 427–441. ^ Fay, Margaret, "The Influence of Adam Smith on Marx's Theory of Alienation", Science & Society Vol. 47, No. 2 (Summer, 1983), pp. 129–151, S&S Quarterly, Inc.